This plan virtually guarantees excellent results even if you don’t think you have artistic ability. This plan shows BOTH SIDES of all six birds to eliminate guesswork. 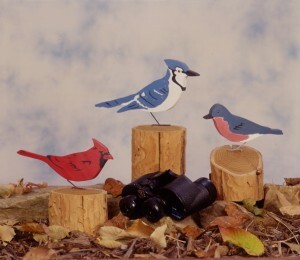 The simplified markings are extremely realistic, but there’s no fancy brushwork involved—it’s as easy as “paint by number.” The step by step directions also include mounting suggestions for display indoors (the beak slots can even hold notes) or outside in flower pots, on fences, deck railings, trees, and more. We even show you how to make realistic feet with ordinary coat hanger wire. The life-size birds are up to 9” long and up to 5 1/2” tall. You get plans for the Blue Jay, (Baltimore) Oriole, Cardinal, Bluebird, Western Tanager, Goldfinch, and Robin.